Design and Budget to determine the scope of your project based on funds available and or financing possibilities. Phasing for building now with what you are willing to spend. Often we factor in what you may build as you earn and as your family and/or needs, grow and change. Your sweat Equity involvement. We manufacture the off-site components from $110 per square Ft. and higher for custom and green application. Plan documents, permit fees, engineering, delivery, foundation installed thru the “Dry in” of our homes is estimated at an additional $25 per Square Ft.
To Plumb and wire and finish our homes with our contractors working with you through the completion estimates at an additional $65 per Square Ft. for a total estimated installed home at $240 to $320 per Square ft. The smaller home cost per square ft. can be higher per ft. and the larger home can cost less per Square Ft. $240 is for the average mid-size 1,000 square ft. home. We can customize any of these plans to meet your requirements. Annie Raitt explaining to clients At the SFO Whole Earth Expo home show in a model yurt we set up on display. Excerpted from the book "Way to Yurt"
he completes, using the conventional contractor's own credit. On the other hand, our clients, for the most part, advance this amount upfront from secured loans or money obtained from a loan secured against your existing home, parents home, savings or inheritances for any or part of the required funding. Banks will partner with you once you have fronted the initial deposit to us to build the off-site portion of your home, for example, the walls, roof(s), windows and doors. 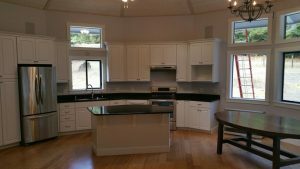 The bank will provide a construction loan to complete the home with a draw schedule that begins to operate in after we set the structure up – mostly on your advance. 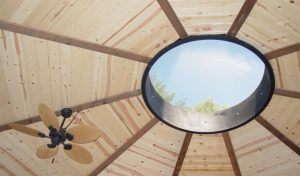 More often than not prospective yurt owners watch the online video tours provided by non-code fabric yurts – which significantly do not meet any of the planning conditions mentioned above. They then set up a ʻa turn keyʼ fabric yurt kit that is more like a tent without paying any local permit fees, support services, etc. and often with alternative septic and power and build and occupy ʻunder the radarʼ for a very little cost. Many of these folks end up at our door after a few seasons. They spend a fair amount of their building budget on this temporary approach – I estimate that thirty-five percent (35%) or more and then have to spend that portion again in abatement fines and removal fees. They then have to begin the process over again but with engineered plans, permits and inspections along the way. However, if you want a permanent warranty guaranteed yurt home with a 50-year roof, built with sustainable materials, that utilizes very little energy to occupy and is protected against theft and extreme weather, and is low maintenance we can assist you. Read Thru our site and educate yourself on what we can deliver. We appreciate your interest. We have four basic designs groups. All have a common entry. 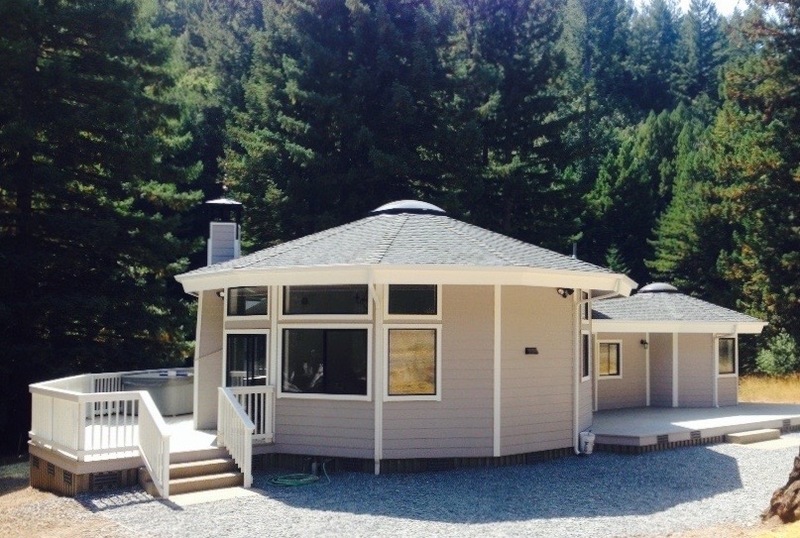 These single round homes are features in our smaller more affordable designs. These homes tend to have less privacy where separate rooms with private access are needed. All movement in these homes are visible and heard by its occupants. If someone goes to the bathroom or accesses a bedroom everyone else in the home will hear and or see that movement. These tend to be louder homes as a result. Often these designs have partial partitions cutting up a portion of there circle to accommodate a better use of space and have a smaller footprint. Most affordable designs and most efficient. Cluster homes offer round rooms with privacy-access. The interconnects house the utilities such as laundry, offices, bathrooms and closets and entryways. When you move throughout these cluster homes kids can be at one end and you can be quietly reading a book at the other end. These designs offer more flexibility. You can often face the sunset and or sunrise and views in these homes where when you have an all in one round home in our nomad series you have to choose which room gets the view. and up have the same benefits as the cluster with interconnects but have the added advantage of more providing upper story panoramic views. These homes often double the square footage on the same footprint. These homes have dramatic design features allowing for a castle like an appearance and are very popular in our larger homes. These homes also fit well on sloped sites. My personal, favorite as these grouping of spaces offers the most privacy with an integrated yard, garden and pool and garage, home studio and office space in a flexible multi-user environment. For large family’s, optional vacation rental units within, homework and studio spaces. Best for a large family as well as a future retirement villa where your caregivers can live separate from the retired owner. Family members can have rooms. These Villas are easy to build in phases and afford the most privacy. Visit my Villa where I live, play and work every winter in Baja. Home office, Home recording studio, Home crafts studio, www.VRBO217070 vacation rental for large groups in a separate space than my private home. I built the villa in 6 phases over 12 years. One year off to enjoy and every other year was in part a build year. Built over time as I earned.